After making it to the beach we needed to make it back to Anaheim to be picked up by our Dad, and the biggest problem that we were facing was the soreness of our rear-ends. But, we biked on. My Dad wanted to meet us at Danny K’s, one of his favorite places to hang out in Anaheim. We figured it was about 13 miles from the beach and so we pedaled onward. The time flew by on the return trip as well, where we spent most of our time trying to sit in a way that preserved our back side. You could feel every bump and every little ditch and each one added a new sensation of pain. We kept peering into the distance seeing if we could see the Big A, in front of Anaheim Stadium that would signal to us that our destination was near. It took some time, but eventually we saw it. We peeled off the trail and made it into Danny K’s were we could finally rest. After exactly 5 hours, a 42 mile bike ride, a 4 mile run, 1 broken bike chain, 1 visit to the beach and 2 sore rear-ends, we had completed our first bike ride together. My Dad invited his good friend, Chris Carlson to meet us at Danny K’s, where we had a coke and shared stories about our journey. Turns out that Chris Carlson was a former bike rider himself and had a pretty good bike that he wasn’t using anymore . . . a Cannondale. The name lost its impact on me, but I knew by the look in his eyes and the tone in his voice that it must be good. He offered it to us so that in the future, we would have better equipment. One feature of the bike that he said would make a huge difference was the gel seats. The bike was fixed and we continued on our bikes toward the beach. 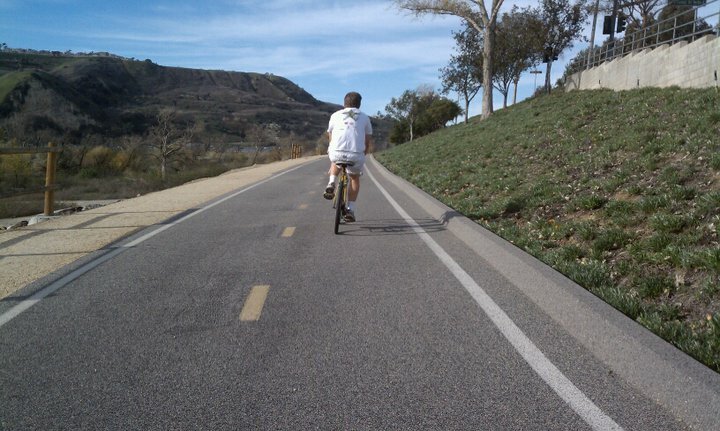 The Santa Ana River Trail is a perfect place to go for a bike ride. The trail goes through Anaheim and down to Newport Beach. You rarely have to cross any streets as you make it through the trail and for the most part the trail is flat. The trail took us right past the Honda Center and Angel Stadium. My brother just purchased season tickets to the Angels so, we anticipate making quite a few bike rides to Angel Stadium by way of the Santa Ana River Trail in the near future. Along the trail they have mile markers until you reach the beach and although we were tired, the time seemed to fly by. Slowly, little signs appeared that let us knew we were close to the Pacific Ocean. First, the smell, the beach has a unique smell and you can sense it’s nearness because of that smell, so we knew we were close. Then in the “river” basin you could see beach sand that had traveled up the river somehow. And, lastly, you could see it. The sight of the beach and the sense of accomplishment that accompanied it was great. We actually rode a bike, from where we lived to the beach. Not many people can say that. We decided to celebrate by stopping inside Newport Burgers to have a hearty lunch. When we got off of our bicycles, one thing was apparent. Our asses were sore! Newport Burgers was a good place to eat, you could tell it was a family owned place decorated with a lot of photo’s from around the 1950’s. After our meal, we needed to ride back to Anaheim to be picked up by another one of our heroes . . . our father. With a sore rear-end and after having rode on a bicycle for 26 miles, and running for another 4 miles, was it possible that we could make it back to Anaheim? Only our butts would have that answer . 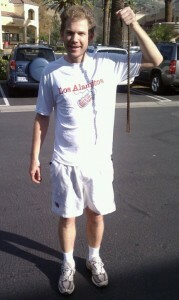 . .
After my bike chain broke, I was ready to call it a day. We had traveled six miles and I figured that the bike chain breaking would be a good story, but my brother had other ideas. He pulled out his new Android cell phone, hit a button and spoke . . . “Bike Shop.” He pushed a couple more times on his phone and he then showed me our new destination, a bike shop . . . alledgedly one mile away on the same road that we were on. So, I figured, “What the heck?” My brother decided to pedal onwards to the bike shop and I told him that I would run the best I could behind him so that we could make it to the bike shop quickly. The shop was located on Imperial Street, which, like I said was allegedly a mile away. “Not to bad,” I thought to myself, I can run that no problem . . . When I arrived at the bike shop . . . 4 MILES later, I was exhausted, not only did I run four miles, but I did it having to run alongside a bicycle. I had assumed that since it was a mile that I could make it quickly, so I ran at a pretty good pace. Each stop light that I came across was not the correct one, so I kept thinking that surely it would be the next one, so I ran even faster only to be let down time after time until, eventually, I made it to Imperial Highway. The bike shop was located in Anaheim Hills, right next to the Fox Fire, which by the way, if you have never been on a Friday or Saturday night, I highly recommend. Especially if you are a people watcher like myself. I went there one time and never had so much fun just watching other people’s behaviors. By the time I got to the shop my brother had just finished purchasing the proper bike chain for twenty bucks. They also were going to charge us ten dollars to install it, we decided to give it a try ourselves. It took us thirty seconds to put the bike chain on. Twenty dollars later and thirty seconds worth of work, I had myself a new bike chain and was ready to get back on the bicycle. We needed twenty-one more miles to make it to the beach. Do you think we made it? Stay Tuned for Part #4 of Zeb and Rocky’s Big Adventure . . .
My original plan was to see how far I could bike without stopping. Ultimately, I need to be able to complete 112 miles on a bike in around 8 hours if I want to be able to complete the Ironman, so I wanted to establish how far I could last without having any training at all. 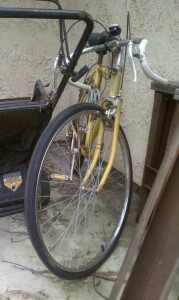 My brother and I worked really hard on fixing up the bicycle as you can read in a previous post, http://runningbrothers.com/363/my-new-bicycle/, but the thing was old and covered in rust. I was a little scared knowing that this bicycle was not in tip-top shape. The gears didn’t work, so I told my brother to set it at the highest gear and I would just work from there. We were dropped off by one of our heroes, our Mom, at the entrance to the Santa Ana River Trail. The ride began simply enough, my brother and I, side by side just like The Lone Ranger and Tonto, only we were riding bicycles (and don’t ask which one was Tonto). Six miles into our adventure, I faced a short uphill climb . . . so I powered my legs to build up some steam to make it to the top of the hill. Just before the top, I heard a loud “SNAP,” the tension in the pedals gave way and my knee skyrocketed up into the handlebars bringing me to an instant stop. I yelled at my brother to stop, but he pedaled on, not noticing my misfortune. Several bike riders behind me stopped to ask if I was ok, I’m assuming because serious injury can come from breaking a bike chain. I retrieved the bike chain and eventually my brother returned to see if I was ok.
At the beginning of the bike ride I planned on trying my best to complete 112 miles and just before we had traveled 6 miles, my rusted bike chain broke and our ride came to an end . . .
Stay Tuned for Part #3 of Zeb and Rocky’s Big Adventure! Our Big Adventure began at 9:15 in the morning at the beginning of the Santa Ana Bike Trail on January 16, 2011. We knew that we would be in for a long day, but had no idea what the day had in store for us. The trail is a 30-mile bike ride from Corona to Newport. My previous long bike ride was just 12 miles. And, not only that, but we would have to make a return trip to Anaheim, another 17 miles or so. 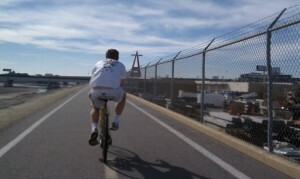 So, with my newly fixed up bicycle, my brother and I headed to the Pacific Ocean. Stay tuned for the rest of our 5-part series: Zeb and Rocky’s Big Adventure. I love to view comments made our posts in order to check out other blogs, one such comment sent me to a series of blogs called Sweat365. I asked one of these blogger, Mitch Roberts, about his affiliation with Sweat365 and how it works. According to Mitch, Sweat365 is a social networking blog used to log workouts and connect with other athletes. Mitch typically uses Sweat 365 as a way to log all of his times, but occasionaly includes blog posts. He has made many friends through Sweat365 and actually has kept in contact with other athletes to help motivate each other. Sweat365 looks like a good way to meet others who like to run, bike and swim. If you plan on running, biking or swimming, it is worth looking into as it’s a community of like-minded individuals who will keep up on their workouts and try to motivate you to keep up on yours.